Although I finished smocked sock 1 last week, I just haven’t had any desire to cast-on the next one yet. I’m just not happy with sock 1 for so many reasons, none of which have anything to do with the pattern. I just really messed this one up. I mentioned the heel, I think, a couple posts back. I ended up with about half the stitches I was meant to. That’s really not good. I was following the pattern closely, so I think I lost something in translation. I also am not a fan of the leg. I should’ve thought about this before I went forward. Because I don’t tend to wear very tall socks, I opted for just past the ankle (that and I was running low on the skein I was working with). Well, the pattern increases around the ankle area to accommodate the amount of stitches you’ll need to go about halfway up the leg. So now the sock flares out dramatically around the ankle and doesn’t hold on. So, I need a temporary break from that project. It’s just driving me up the wall. Instead, I’m working on my hexipuffs! I did, in the end, decide to let Rizzle keep the ones she claimed. After all, she really does love toting them around. I’ve been using up the purple sock yarn for these first batch. I got about 10 hexipuffs from the first sock’s leftovers (not bad at all! ), and I’m now on the second sock. I love this pattern. Each puff is relatively quick to knit up. 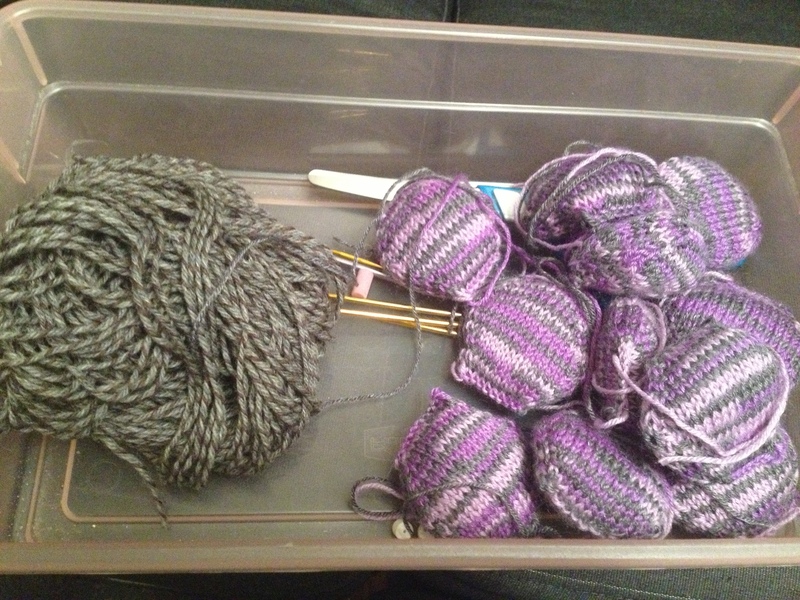 I’m still a little slow, so it takes me about 30-35 minutes per hexipuff. I think it’s mostly because I knit them while watching podcasts like the Fat Squirrel Speaks on my phone. Keeps me entertained, and they’re so small that it’s like nearly instant satisfaction. I don’t have to work for hours (although I do love to) to have a completed knit. Anyone else working on hexipuffs? I had never heard of these before! Seems like it would make quite an excellent blanket (and a warm one!) when finished. Uhoh…I think I have a new obsession! Thanks so much for sharing! Love your hexipuffs. Sorry your sock has given you trouble. I frogged one last week for the same reason. I’ve admired the hexipuff quilt online but I just know I could never bear to sew them all together … good luck! I have to admit, I’m completely intimidated by that part. I’ve been kind of putting it to the back of my mind until I get anywhere near close enough to start doing that. I did read somewhere that some people have sewing parties for this blanket, where a bunch of friends come over and everyone helps with the assembly. I may have to go that route.